Bankruptcy law sets out six categories of bankruptcy. 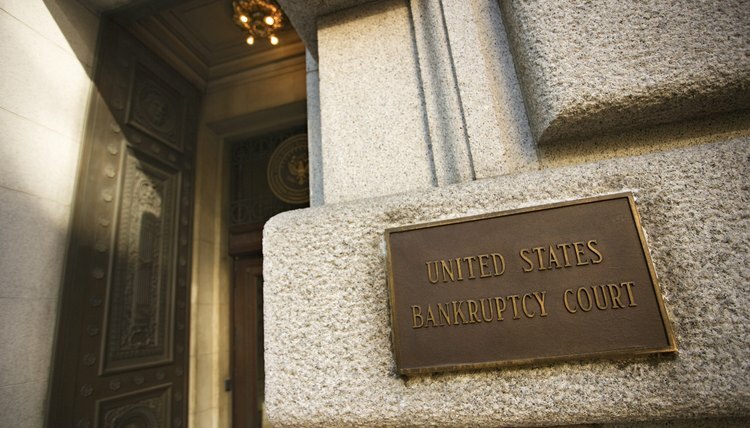 The most common types of bankruptcy for consumers are Chapter 7 and Chapter 13. Chapter 7 involves a liquidation of the debtor's assets. The bankruptcy trustee takes over the assets and, other than a limited number of exempt items, sells them and distributes the income to creditors, then discharges the remaining debts. Chapter 7 is only available to individuals with limited income. Chapter 13 adjusts a consumer's debt by developing a plan for repayment over the course of three to five years. Chapter 13 allows the debtor to keep more assets than Chapter 7 and is available to individuals with income above the limits for Chapter 7. Once a consumer has filed for bankruptcy, creditors may file proofs of claim, meaning they will file evidence that they are owed money. The proof of claim form along with instructions for completing and filing it are available online through the U.S. Bankruptcy Courts. Proofs of claim must be completed and filed before the deadline, which is called the 'claims bar date.' The claims bar date for most proofs of claim in Chapter 7 and Chapter 13 bankruptcies is 90 days after the creditor's meeting. In other types of bankruptcies, the court will set the proof of claim deadline. If the deadline was missed for an excusable reason, the court has discretion to allow late proof of claim filings. The debtor can file an objection to the proof of claim if the claim is fraudulent or inaccurate. The contested claim issues then go to litigation before the bankruptcy court. A creditors' meeting, also called a 341 meeting after the relevant section of the bankruptcy code, is not a court hearing but rather an opportunity for the bankruptcy trustee and any creditors to ask questions of the debtor about his or her bankruptcy petition. Although creditors rarely attend these meetings in consumer bankruptcy cases, the 341 meeting does allow creditors the chance to question the debtor about assets, the timing and nature of debts incurred, and any other information which might affect the creditor's proof of claim or create a basis for objecting to the bankruptcy discharge. Creditors can file an objection to bankruptcy discharge to attempt to stop all or a portion of the discharge from being granted. Not all debts are dischargeable in bankruptcy, so a creditor facing erroneous discharge may object to correct the order. Additionally, creditors may object to the discharge if they have reason to argue that the debtor is hiding assets, has committed fraud, or is about to come into assets shortly after the bankruptcy that would be available to pay off debts. Creditors are cautious in filing objections to discharge, however, because if they are successful it opens up all creditor claims and not just that of the creditor making the objection, so unless available assets are substantial, the creditor may receive very little for their trouble.